Early help is about children, young people and families getting the right help at the right time, before issues get worse. We recognise that some children will need extra support in order to be healthy, safe and to achieve their potential. A child needs protection – if you feel that a child is suffering harm, neglect or abuse, the helpdesk can investigate and act to protect the child. A family is under stress – the helpdesk can offer support and advice and help families access support from other services. A child is seriously ill or disabled – the helpdesk can arrange an assessment of the child’s and families needs and provide support. If you are concerned about the immediate safety of a child please contact the Police on 999. *FGM may also be known as “female circumcision” or “cutting”, and by other terms such as sunna, gudniin, halalays, tahur, megrez and khitan, among others. 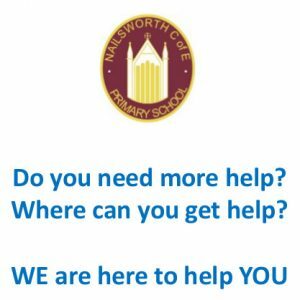 This leaflet, produced by Nailsworth C of E Primary School, outlines how WE can help YOU as a family detailing your key school and local contacts. Inspector Fay Komarah is the Gloucestershire Police contact for honor-based violence. Freedom Charity https://www.freedomcharity.org.uk provide help and advice in a bid to combat all forms of so-called ‘honor-based’ violence. Helpline is 0845 607 0133, text the words ‘4freedom’ to 88802. Online Safety https://www.thinkuknow.co.uk/ is produced by National Crime Agency CEOP Command and is packed with useful information and guidance for children, parents and teachers. Mental Health concerns https://www.onyourmindglos.nhs.uk/- great for young people, parents and professionals in terms of help with mental health issues and where to go for help. 24-hour answerphone service responded to within 24 hours. Confidential and anonymous email support service: support@glosrasac.org.uk The support workers are all women, who are specially trained to work with survivors of sexual violence. Radicalisation and Extremism www.educateagainsthate.com The government website providing information and practical advice for parents and educators on protecting children from radicalisation and extremism. Children who run away (missing persons/missing children) PC Christina Pfister (Missing persons Coordinator Gloucestershire Police). The ASTRA (Alternative Solutions To Running Away) has the primary aim of reducing the incidence of persistent running away across Gloucestershire. The project provides support, advice and information to young people up to eighteen years old who have run away. This might be from a family home, foster home or from a residential unit. ASTRA provides support after the event to enable a young person to address the causes of running away. The ASTRA project offers young people help and the support required to find Alternative Solutions To Running Away. Freephone Telephone number: 0800 389 4992 EXCLUSIVELY for young people who have run away and have no money. All other callers are asked to use the ‘ordinary’ number tel: 01452 541599. Children Missing Education (CME) Anyone concerned that a child is missing education (CME) can make a referral to the Education Entitlement and Inclusion team (EEI) at Gloucestershire County Council: 01452 426960/427360. Gloucestershire County council website information on private fostering. Refer to Gloucestershire Children & Families Helpdesk on 01452 426565 or Gloucestershire Private Fostering Social Worker 01452 427874.